The term ‘FPMT’ is the acronym for The Foundation for the Preservation of the Mahayana Tradition. It refers to an international affiliated network of centers, projects, and services. 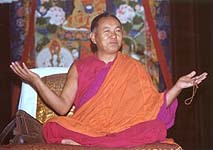 This network is sometimes called the FPMT organization. This network of city centers, retreat centers, monasteries, nunneries, publishing services, hospices, and other services and projects functions to achieve the FPMT mission to preserve and spread Mahayana Buddhism worldwide. The FPMT organization was founded in 1975 by Lama Thubten Yeshe (1935-84) and Lama Thubten Zopa Rinpoche, both Tibetan Buddhist monks. The Foundation is devoted to preserving and spreading Mahayana Buddhism worldwide by creating opportunities to listen, reflect, meditate, practice, and actualize the unmistaken teachings of the Buddha and based on that experience spreading the Dharma to sentient beings. We provide integrated education through which people’s minds and hearts can be transformed into their highest potential for the benefit of others, inspired by an attitude of universal responsibility and service. We are committed to creating harmonious environments and helping all beings develop their full potential of infinite wisdom and compassion. Our organization is based on the Buddhist tradition of Lama Tsongkhapa of Tibet as taught to us by our founders Lama Thubten Yeshe and Lama Zopa Rinpoche. FPMT, Inc. is the non-profit religious corporation incorporated in the State of California, USA. FPMT International Office is the the headquarters of the FPMT organization, and the corporate office and principal place of business of FPMT, Inc.. This Documentary is a Work in Progress that explores the history and future of FPMT and the Mahayana Tradition.